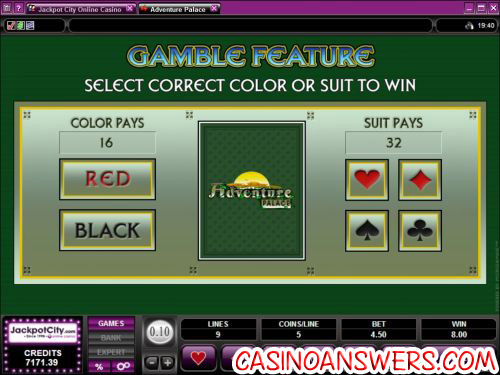 Adventure Palace Video Slot Guide & Review - Casino Answers! 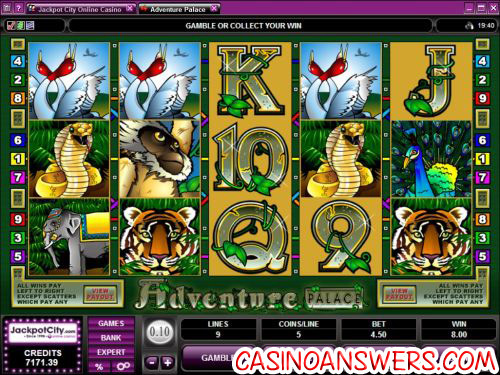 Adventure Palace is a 5-reel, 9-line video slot developed by Microgaming, featuring wild symbols, scatter wins, multipliers, a gamble feature and a free spins feature. You can play the Adventure Palace video slot at All Jackpots Casino and River Belle Casino. To play the Adventure Palace slot game, you must first set a coin size of $0.01, $0.02, $0.05, $0.10, $0.20, $0.25, $0.50 or $1. You can then set the number of coins you wish to bet per payline (up to 5) and the number of active paylines you wish to play (up to 9). You can make a total wager as small as $0.01 and as large as $45 on Adventure Palace. To bet all 5 coins and make all 9 lines active, use the “Bet Max” button. To play the game with the wager currently set, use the “Spin” button to play. To win the top jackpot of 10,000 coins on the Adventure Palace video slot, 5 Elephant symbols must appear on an active payline. The Elephant symbol is also the slot’s wild symbol and will substitute for all other symbols except for the scatter symbol. When the Elephant symbol participates in a winning combination, it will double your win. When 3 or more Scattered Jungle symbols are hit, you will win 15 free spins with a 3X multiplier. All of your wins will be tripled during the free spins feature. The free spins feature can be re-activated during free spins. All bets and lines played are the same as the game that started the feature. Scatter wins are multiplied by the total number of credits staked. Scatter wins are added to payline wins. Only the highest win is paid per active payline. All wins pay left to right except for scatters (which pay any). All wins are multiplied by the credits staked per line except for scatters. Hit the “Expert” button and you will be able to access Adventure Palace’s autoplay mode. You can hit the “5X” or “10X” buttons for quick autoplay spins or you can open the advanced features using the “Auto Play” button. You will be able to select the number of spins (from 5 to 500) and the number of seconds between spins (0 to 1.50). The advanced stop settings are: stop once all spins are complete, stop when jackpot is won, stop if a win exceeds or equals (from $25 to $2500), stop on any win, stop on free spin feature and stop if credits increase/decrease (from $25 to $2500). You can cancel the autoplay mode at any time. If you are looking for a great signup bonus to play the Adventure Palace slot machine with, look no further than the 100% up to $200 signup bonus you will get when you sign up at All Jackpots Casino. Is there an Adventure Palace Flash game available? Yes, you can play a no-download version of Adventure Palace at All Jackpots Flash Casino. If you experience any issues with the Flash game, make sure you have the newest version of Adobe Flash Player installed. Where can I play the Adventure Palace online slot machine? You can play Adventure Palace at either All Jackpots Casino or River Belle Casino. For more information on All Jackpots, please read our All Jackpots Casino Review. What casinos have the adventure park slot?